Lychas spinatus besti is a species previously lumped in with Lychas variatus. Here I recognise it as a valid species and show the unique behaviour of the sexual sting never recognised or described in any form of Australian Lychas before. This subspecies occupies the mallee regions of South Australia and Victoria. 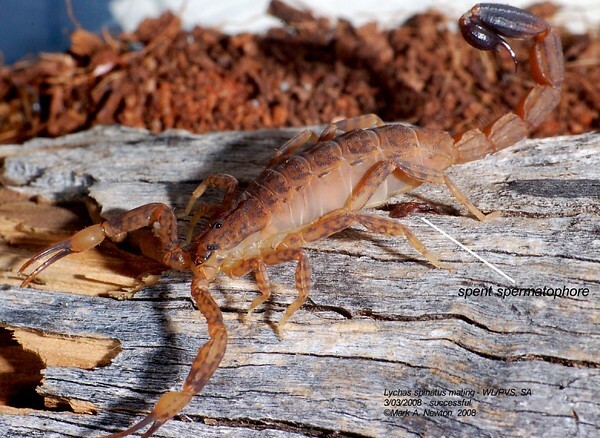 It is active over the warmer months and is found syntopically with a number of other scorpion species such as: Urodacus armatus, Urodacus yaschenkoi, Lychas armatus, Lychas jonesae, Lychas buchari, Isometroides vescus, Isometroides angusticaudus and Cercophonius kershawi. A medium sized marbled Buthid, light brown in appearance of around 30-50mm - Often with 3-4 orange spots along the posterior edge of each tergite and either side of the mid-dorsal line of the mesosoma, which is a typical colour pattern of many Lychas and Isometroides possibly reflecting evolutionary relationships. Accessory keel on the 3rd metasomal segment represented by an indistinct scattering of granules. Subaculear tubercle well developed. 2 accessory teeth on the last row of teeth of the moveable finger of the manus. 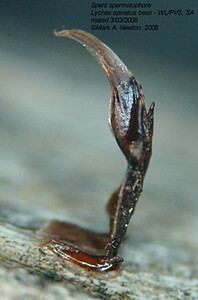 Males have a significantly longer metasoma than that of the female and employ the sexual sting during the promenade. Another unusual feature is that the 1st instar larval young orient longitudinally across the mothers dorsum. 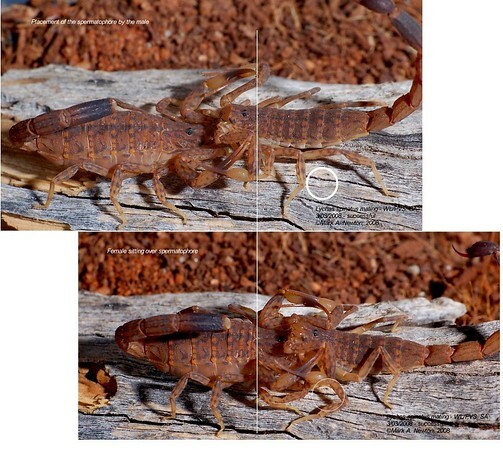 In Urodacus elongatus the male stings the female in a chelal joint, in L. spinatus besti the sting is in the body (see images). 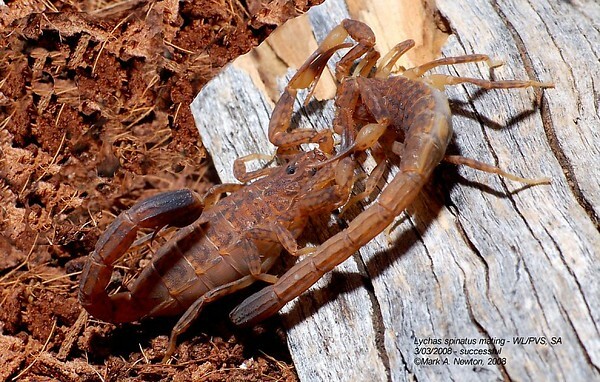 Before the male drags the female up onto a suitable substrate surface such as a log or piece of bark he employs the sexual sting, which can occur a number of times on both sides of the body. 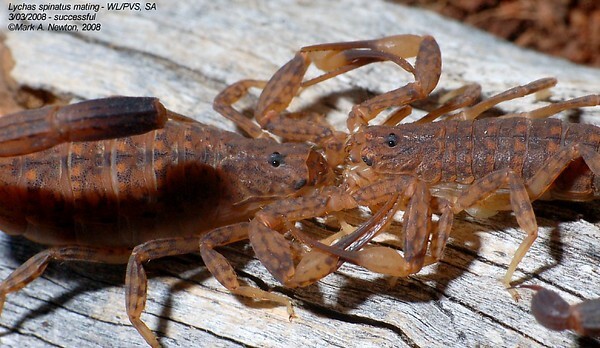 When the male is satisfied he pulls the female up onto the deposition surface, lowers his mid-body against the substrate and releases his spermatophore. The sticky foot adheres to the substrate as the male raises his body away from the spermatophore before pulling the female directly over it. The spermatophore enters her gonopore with the distal lamella bending during her squatting action, resulting in spermatozoa being released inside her reproductive tract. 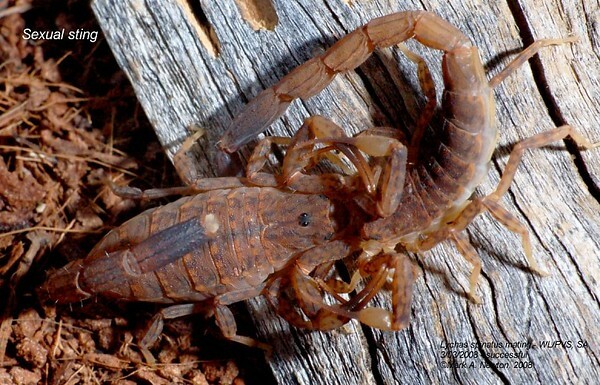 Once this occurs the male immediately breaks his grip on her chela and backs off, indicating the female may be capable of making a meal of the male. Once the male has released grip, the female oscillates her body up and down and in a circular motion over the spermatophore, presumably to aid in uptake of spermatozoa. Once she is satisfied she moves away from the spent spermatophore. Shown Right: In Buthids the spermatophore is of the flagelliform type, named according to the shape of the distal lamella. In Urodacus the spermatophore is lamelliform. 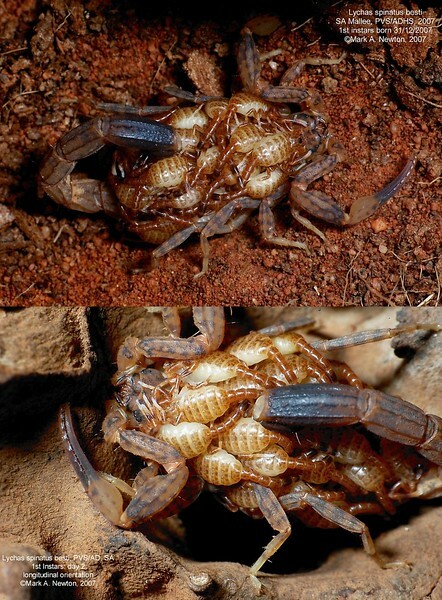 About 6 months after insemination as many as 20-30 1st instars are born and remain on mum's back until they shed their skin about 3-4 days later. The young adopt the longitudinal DOP (dorsal orientation pattern), rarely seen, but common in the North American Vaejovidae (Ross, 2009). In this pattern each young has contact with mum's dorsum as they line up behind each other and appear as leaning books. It is not understood exactly why some young adopt this orientation, the most common being random, where young orient in any direction and sit in layers. In the longitudinal DOP the young do not layer. I have noticed the young change to random DOP the day before ecdysis and also become vagile whereas when longitudinal they remain stationary. Ross LK. (2009). 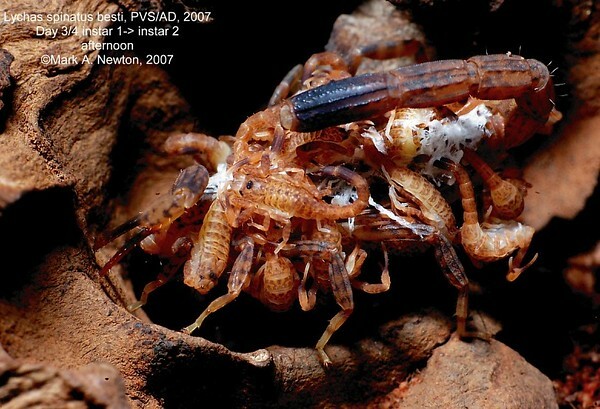 First report of random larval orientation in the genus Vaejovis C. L. Koch, 1836 (Scorpiones: Vaejovidae). Boletin Sociedad Entomológica Aragonesa. (45):531-2.